Enter the new era of dental care. For centuries man has struggled to find answers to the complex problems associated with tooth loss. 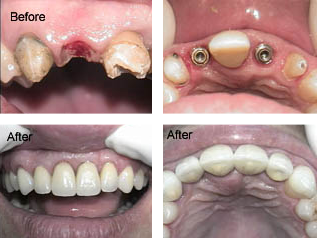 Many have dreamed of replacing missing teeth with the look, feel and function of natural teeth. Dental implants make that dream come true! hard to clean bridgework not only makes us feel and look older than we are but also affects our ability to enjoy life to it’s fullest. Now thanks to modern dental implant technology, we can offer real answers to these real problems. At Distinctive Dentistry of Chester County, we aim to provide you with comprehensive care. Dr. Kevin Smith has taken many advanced post graduate courses so that he could provide our patients with the surgical care that is often refered out to a specialist in other offices.